I first came across this quote at the beginning of the 2016 NSA Conference in Atlanta, USA. A tradition at NSA conferences is attaching special ribbons to name tags reading “speaker”, “first timers”, and “parent”, and some with witty sayings such as “old timer” for attendees who have attended at least 10 conferences. The Atlanta conference was my 7th and I noticed a new witticism on the ribbons for twentysomething attendees – “I’m worth waiting for”. Agreed. For example, my friend and fellow stutterer, Grant Meredith, is an Associate Dean (Student Retention and Success) for the Faculty of Science and Technology at Federation University Australia. He won multiple Unijobs Lecturer of the Year Awards as chosen by the students two years in a row and was the Alumni of the Year for 2015. As Grant shared in an article for the British Stammering Association, one of the many reasons that he and peer reviewers notes is that his stuttered speech prevents his lectures from becoming monotonous and keeps student interest. In fact, students hang on the edge of their seats curious to know the outcome of Grant’s long blocks or maybe it is because they just do not know what he will say next? 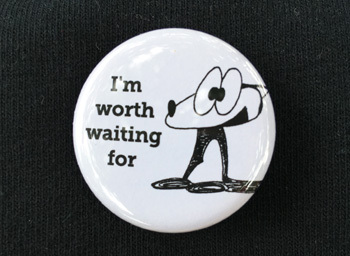 The “I’m worth waiting for” button makes a great ice breaker for any occasion. It is available in the Stuttering Awareness collection of five buttons starring Franky Banky, a cartoon fox who stutters who appears throughout my stuttering survival book entitled Stuttering is Cool: A Guide to Stuttering in a Fast-Talking World. You can purchase both in the Stuttering is Cool Online Shop. Previous Post Stories behind the buttons: I Stutter, So What?